U.S. News recently published an article on the “Top 6 Experiences in Southern California” and we are proud to say that each (and more!) 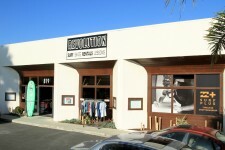 is found in Ventura, a laid-back beach town on the central coast. Ventura has fantastic weather year-round, earning it descriptions like “the land of eternal spring.” Whether you want to surf, paddle-board, kayak, jet ski, catch a professional surfing tournament or take a surf lesson from a professional surfer, we have it all. Kids and kids at heart will love the seaside playgrounds, where swimwear and flip-flops are encouraged at Ventura Beach and Marina Park. Marina Park beach is also the perfect place to picnic, barbecue, and even has a giant pirate ship complete with its very own zip-line! The Ventura Beach Promenade is a wonderful walk next to the ocean and can be spiced up by renting brightly colored deuce-coupes to cycle in style. 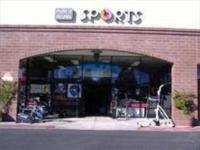 Wheel Fun Rentals also offers cruiser bikes, mountain bikes, boogie boards or iconic four-wheel Surrey bikes that have room for the whole family. Harbor Cove Beach, or Mother’s Beach, is a favorite among families with young children because the harbor’s breakwaters provide safety from big swells. The beach also has beautiful views of the entire Ventura coastline and hills, small lapping waves, and windblown sand dunes. It’s the perfect spot for waterfront activities like kayaking and flying kites. Ventura Harbor Village is conveniently right across the street, so you’re smack dab in the middle of everything. You can make a day of it with restaurants, ice cream shops, an arcade, and the Channel Islands National Park Visitor Center just around the corner. Everything your family needs is here, including abundant free parking, lifeguards, restrooms and foot showers. Find more ideas for family fun activities here. One of Ventura’s oldest and beloved traditions is the Ventura County Fair! The fair began in 1875 and continues to grow every year. Enjoy beachside rides like the Ferris wheel that overlooks the ocean. Time it right and you’ll catch the sun setting over the water. The fair also features nightly beachside fireworks and music concerts. Other popular beachside events include the Ventura Beach Marathon, Pier Under the Stars, the Aloha Festival and the uniquely entertaining Surf Rodeo that combines surfers, cowboys and bikini-clad cowgirls for a weekend of corn hole, surf and bikini contests paired with 25 world class bands. Visit our events calendar to find more. Ventura’s beaches are consistently graded the cleanest beaches of southern California. In fact, all of Ventura’s beaches were awarded straight A’s for quality during the summer weather on the 2015 Beach Report Card by Heal the Bay, a nonprofit organization that advocates for the environment, Ventura County also succeeded in the wet weather test, with 89% of the beaches getting A’s and B’s—some of the top grades around. Ventura’s clean and safe beaches reflect the commitment of many Venturans, who are stewards of our coastlines working to keep our beaches free of trash and debris. In 2014, volunteers collected 3,358 pounds of trash and 228 pounds of recyclables from Ventura beaches. If you’d like to get involved, keep an eye out for California Coastal Cleanup Day in September, which involves around 1,000 volunteers each year. If you’ve ever spent time in southern California, you know how hard it can be to find free parking (especially by the beach), but not in Ventura! Marina Park, Seaward Village and Surfer’s Point offer free lots, and Ventura Pier has free parking for customers of any of their three restaurants. Faria beach also has free roadside parking, but it can fill up quickly on holidays and weekends. Ventura Harbor Village has tons of free parking by Harbor Cove Beach and Surfer’s Knoll Beach. If you still can’t find a spot, the Ventura County Fairgrounds offers all-day beachfront parking for $2, and San Buenaventura State Beach Park has endless spots at $10 for all day use by their picnic areas, grills, restrooms, volleyball nets and weekend food truck. Ventura is a “I went surfing in the morning, had tacos on the pier for lunch and went kiteboarding in the afternoon” kind of destination. C-Street in downtown is one of the best beaches for kitesurfing in California. It’s a local hotspot because of its wave quality, favorable wind direction (side shore, with a bit of side-off sometimes), friendly atmosphere, rider capacity and point break with waves peeling all the way around the corner. Kitesurfing conditions are consistently good and water temperature doesn’t vary too much either. You’ll especially want to be here during the summertime South West or South swells. Kite adventurers will also like the wintertime, when the sun shines on the water for kitesurfing and snow has fallen around Lake Tahoe for snowkiting. For information about local kitesurfing lessons and equipment rentals, contact VenturaKiteBoarding.com. Not only are dogs welcome at Ventura beaches, they surf too! Ventura beaches have become dog friendly hot spots on the West Coast. Man’s best friends are welcome at Surfer’s Point, Marina Park, Harbor Cove and Promenade Park beaches. If you’re lucky, you may even run into local celebrity, Haole, the surfing dog who loves to hit the waves. Ventura is also home to the Pooch Parade, an annual celebration for dogs everywhere. The Pooch Parade is a three-mile walk along the Ventura Beach Promenade that raises funds to support dog rescues, rehabilitation, adoption and dog owner education programs by the Canine Adoption and Rescue League. 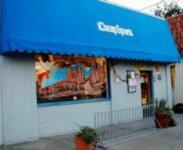 Find more about Ventura’s most popular dog friendly spots here. Ventura is especially proud of its pier. The Ventura Pier is one of the longest wooden piers in California, standing as a symbol of the region’s rich history and natural resources since 1872. Today, the Ventura Pier is a favorite attraction for fishing, sunset strolls and great eats with beautiful views of the coastline and Channel Islands. The Beach House Fish fresh seafood market and restaurant offers spectacular views of the pier with a casual, eclectic fish market menu that has something mouthwatering for everyone. Beach House Tacos, a small taco shack at the base of the pier, is a local favorite for kicking back and watching the waves. Sitting on the pier with a beer in one hand and a taco in the other makes it feel like summer year-round. Another fresh seafood option is the Fisherman’s Market, featuring local commercial fishermen’s catches every Saturday at Ventura Harbor Village. Early rising pays off at this first-come-first-serve market where the catch varies every week and frequently includes tuna, halibut, rockfish, sea bass, prawn, crab and sea cucumber. The Jolly Oyster is a culinary delight for foodies, seafood lovers and environmental sustainability enthusiasts. This truly unique beach experience began when The Jolly Oyster’s co-founders, concerned about the depletion of the world’s fish stocks, decided to dedicate their lives to sustainable shellfish farming. Ever since The Jolly Oyster’s debut at San Buenaventura State Beach Park, locals and visitors alike flock to experience seaside oyster shucking. The Jolly Oyster’s shuck shack sells raw oysters and clams, sauces, and rents shucking knives. Then patrons BYOB and cook the food themselves on grills next to the picnic tables. For those looking for no prep required meals, The Jolly Oyster’s food truck offers Bay scallop ceviche, stone crab claws and grass-fed beef burgers. If you still have some of your BYOB drinks leftover, feel free to enjoy them at San Buenaventura State Beach Park. From Martha’s Vineyard (by Marina Park) to Ventura Pier, go ahead and have a picnic on the beach with a bottle of wine from one of our local wineries, bring a cooler of ice cold brews, or simply sit back with drink in hand while the sun sets over our little piece of paradise on the central coast. 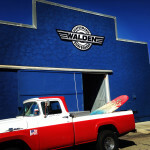 Situated just north of Malibu and just south of world famous Rincon (where Kelly Slater has been seen surfing! 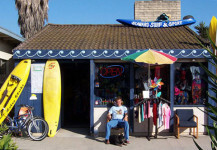 ), Ventura beaches have fantastic surf spots all along the coast and are at their very best in the early morning. 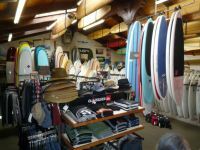 Ventura is also the best winter surf location in the continental US and rivals San Clemente and Huntington Beach as Surf City, USA with great breaks year-round, a rare treat in the surfing world. The most popular spot among locals is C Street, or Surfer’s point. Surf legend Tom Morey, also known as Mr. “Y” — who invented the body board, staged the first professional surf contest in Ventura, invented the first removable surf fin system, and co-developed the first-ever soft surfboard — calls Ventura special as a surfing destination given its easy access roads, ample free beach-side parking, and 10-15 miles of point breaks culminating at Rincon, the finest break in the continental US. 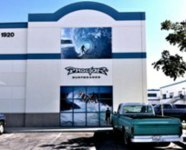 Many famous surfers, including Mary Osborne and Steve Walden, have made Ventura their home and offer opportunities to learn to surf from the pros! 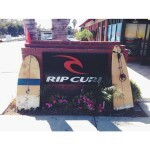 For listings of surf lessons or equipment rental locations, scroll to the bottom of this page. It’s no secret that being by the ocean has numerous benefits for your body and mind. The sand gets you out of the car to slow down, the water allows you to float and literally take the weight off your shoulders, while the sounds of waves sooth you in ways even spas can’t replicate. According to marine biologist Wallace J Nichols, we all have a ‘blue mind,’ which is a sense of calm, peacefulness, unity and a general happiness and satisfaction triggered when we’re in or near water. Water gives a sense of connection to something beyond oneself and induces meditative states that give our brains a rest. In other words, being by the water helps you relax and live in the moment. Take advantage of Ventura’s miles of pristine beaches, where you can hunt for sea glass and sand dollars, build rock sculptures or watch surfers and dolphins play in the waves. Soon you’ll discover our laid-back and relaxed atmosphere extends beyond the beach and you’ll never want to leave. Explore Ventura’s endless beach and beyond the beach activities.